The Panasonic AJ-HD 1800 DVCPro HD VTR is a studio DVCPRO HD VTR designed to tackle the most advanced needs in high definition acquisition and delivery. 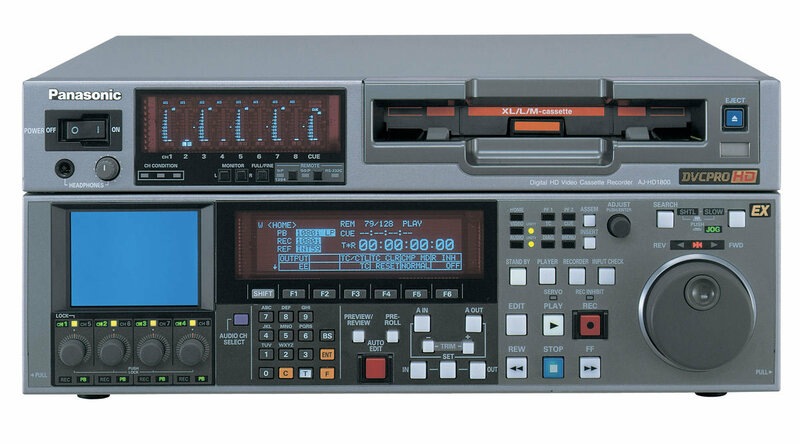 The VTR features support for DVCPRO HD-LP recording which provides extended recording times over previous versions, allowing up to 126 minutes of HD footage on a single cassette tape. Capable of recording three flavors of HD (1080/60i, 720/60p, and 1080/50i) the AJ-HD1800 is a versatile performer. Mastering for digital cinema purposes couldn’t be easier; The VTR can directly convert Varicam 720/24p footage to 1080/24p. With the ability to handle a wide range of HD content along with standard definition formats such as NTSC and PAL, the AJ-HD1800 is a perfect solution for high end studio mastering applications. Using the DVCPRO HD-LP XL tapes, the AJ-HD1800 is capable of recording over 2 hours of high definition footage using highly efficient DVCPRO HD compression technology. The VTR can play both high definition 1080i and 720p formats at either 60 or 50 Hz, making it useful in both NTSC and PAL environments. This added versatility gives mastering studios a cost-effective means to record and deliver broadcast-ready content all around the world! Eight Channels of audio are recorded in high quality 16-bit/48 Hz format, making it a perfect solution for mastering to standards such as Dolby Digital 5.1 surround sound. The AJ-HD1800 can perform 720/1080 cross conversion, providing users with added flexibility. The deck can also up-convert standard definition footage to DVCPRO HD. This can be useful for incorporating archival material into new high definition projects as well as simply “future proofing” standard def projects for later use. Rent the Panasonic AJ-HD 1800 DVCPro HD VTR from Deck Hand Camera Rentals Today!